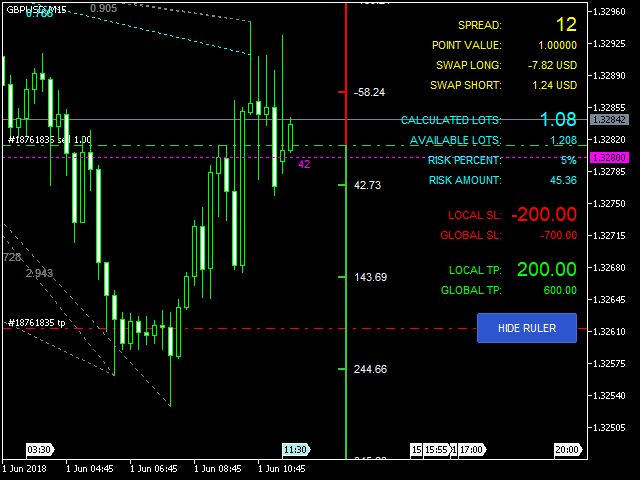 This indicator is designed to provide all useful information about symbol, account, positions and profit. It is developed for improving trader's money management. Calc can be divided to separate blocks. Each block is possible to hide, set its own color and other properties. This block displays information about actual SPREAD, POINT VALUE (in deposit currency for 1 lot), SWAP LONG and SHORT. It is calculated using stop loss line (horizontal dotted line in Magenta color). This line represents virtual stop loss related to current price. It measures range between them. Result of this range is used for calculation final volume according to money management. You can set money management as percent from actual balance or as absolute value. Stop loss line can be moved up and down for better adjustment of stop loss. All related data are recalculated immediately. This represents maximal volume for opening position. It works for FOREX and CFD. This block displays information about stop loss amount and take profit amount on actual symbol and all symbols together (in case of opened positions on more symbols). It can be useful when trader wants to have control of his profit/loss. All these blocks have own legends. This legend can be displayed/hidden (see parameter "Show legend") and moved to the left/right side (see parameter "Legend horizontal position"). It is special tool which is designed to fast calculate possible profit/loss. When this tool is enabled, it creates "ruler" on the right side of chart. On this ruler you can easy track actual profit/loss according to your money management. When trader does not have open position on actual symbol - ruler displays potential profits on both sides (LONG, SHORT). It means that if you open position now with volume from calculated lots, then values on the ruler represent your potential profit. When trader has open position(s) on actual symbol - ruler displays profit and loss according to open position(s). You can specify how many values will be displayed, adjust colors and simply display or hide ruler by button.